Product #49533 | SKU SR-XLM1 | 0.0 (no ratings yet) Thanks for your rating! 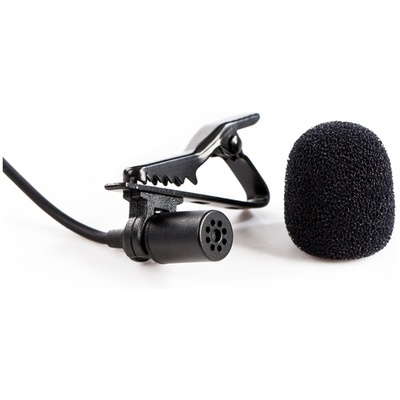 The SR-XLM1 Omnidirectional Broadcast-Quality Lavalier Microphone with 3.5mm TRS Connector from Saramonic is designed to capture audio for discreet and portable usage with DSLR cameras, camcorders, recorders, and other portable devices. It can be used for interview, podcast, dictation, and other hands-free applications. Featuring an alligator-style lapel clip for easy and secure attachment to your shirt or lapel, the microphone has a permanently attached 6 m cable to maximise freedom of movement and accessibility. The SR-XLM1 provides improved sensitivity and a higher signal-to-noise ratio compared to other popular lavalier microphones, which makes it a suitable performance/cost value. In addition, a foam windscreen is included.